I am really feeling the bold cuffs this season. Although I will always be a fashionista that loves to stack bracelets (it's classic), I will also venture into the bold, single pieces such as the cuff. 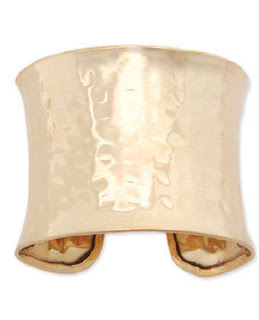 I saw a lot of cuffs used as accessories last night on the finale of Project Runway. The cuffs were elegant and lent an edge to the fierceness of the ensembles they accompanied. By the way, Jillian's collection by far was the most wearable and fashion forward. However, Christian is just bananas! That feather dress at the end was beautiful. I'll try to get the pics of my favorites later on. 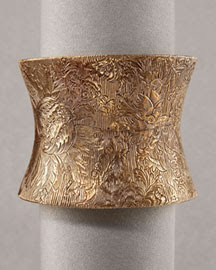 Here is a high end and low budget alternative for the metal cuff. This is such an equisite piece of jewelry. I love the color and detailed design.